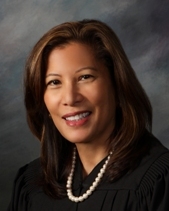 Chief Justice Tani Gorre Cantil-Sakauye is the 28th Chief Justice of the State of California. She was sworn into office on January 3, 2011, and is the first Asian-Filipina American and the second woman to serve as the state’s chief justice. overwhelmingly approved by voters in the November 2010 general election. At the time she was nominated as Chief Justice, she had served more than 20 years on California trial and appellate courts, including 6 years on the Court of Appeal, Third Appellate District, in Sacramento. Former Governor Arnold Schwarzenegger nominated her as Chief Justice on July 22, 2010, and the California State Bar Judicial Nominees Evaluation Commission rated her as exceptionally well qualified for the position. At a public hearing on August 25, 2010, she was unanimously confirmed by the Commission on Judicial Appointments, and in a general election on November 2, 2010, an overwhelming majority of voters elected her to that position. As Chief Justice she also chairs the Judicial Council of California, the administrative policymaking body of state courts, and the Commission on Judicial Appointments. Before her elevation to the Supreme Court, Chief Justice Cantil-Sakauye served for more than 20 years on California appellate and trial courts. In 1990, Governor George Deukmejian appointed her to the Sacramento Municipal Court and in 1997; Governor Pete Wilson elevated her to the Superior Court of Sacramento County, where she presided over both criminal and civil cases. In 1997, she established and presided over the first court in Sacramento dedicated solely to domestic violence issues. In addition, then-Judge Cantil-Sakauye chaired the court’s criminal law committee and was a member of the presiding judge’s task force on domestic violence and the Home Court committee. In 2005, Governor Schwarzenegger nominated her to the Court of Appeal, Third Appellate District. Chief Justice Ronald M. George appointed her to the Judicial Council of California in September 2008. She has also served as chair of the council’s Advisory Committee on Financial Accountability and Efficiency for the Judicial Branch, a member of the Domestic Violence Practice and Procedure Task Force and chaired its Best Practices Domestic Violence subcommittee, vice-chair of the Executive and Planning Committee, vice-chair of the Rules and Projects Committee, co-chair of the Judicial Recruitment and Retention Working Group, and as a member of the Commission for Impartial Courts Implementation Committee. The Chief Justice was a Special Master, selected by the Supreme Court of California to hear disciplinary proceedings before the Commission on Judicial Performance. She was president of the Anthony M. Kennedy American Inn of Court, an organization dedicated to promoting civility, ethics, and professionalism in the practice of law. And was a member of the national Conference of Chief Justices Board of Directors. A Sacramento native, Chief Justice Cantil-Sakauye attended C. K. McClatchy High School and Sacramento City College, before graduating with honors from the University of California, Davis. After taking a year off to visit her ancestral homeland, the Philippines, the Chief Justice began law school, receiving her JD from the UC Davis, Martin Luther King, Jr., School of Law. She worked as a deputy district attorney for the Sacramento County District Attorney’s Office, and then served on the senior staff of Governor Deukmejian, first as deputy legal affairs secretary and later as a deputy legislative secretary. Chief Justice Cantil-Sakauye is a former board member of several nonprofit organizations and has been active in numerous professional community organizations, including membership in the California Judges Association, the National Asian Pacific American Bar Association, and the Sacramento Asian Bar Association, and received the Filipina of the Year Award. She is currently a member of the Board of Directors for the Conference of Chief Justices, The American Law Institute, the Board of Visitors for UC Davis, an Advisory Board member of the Sacramento Federal Judicial Library and Learning Center Foundation, an honorary member of the Foundation for Democracy and Justice, a private nonprofit organization devoted to civics education. She is married to Mark Sakauye, a retired police lieutenant. They have two daughters. As leader of California’s judicial branch of government and chair of the Judicial Council, Chief Justice Cantil-Sakauye has focused on a vision for improving the public’s access to justice, building partnerships to lead the judicial branch out of the state’s worst fiscal crisis since the Great Depression, and using ongoing self-assessment to improve the branch’s efficiency, effectiveness, transparency, and accountability. She has also taken a leadership role in revitalizing civic learning and engagement in the state. When Chief Justice Cantil-Sakauye took office in 2011, the state was deep into a fiscal crisis that arose out of the Great Recession of 2008. The judicial branch was absorbing the single largest budget cut in its history. In her first year, the Chief Justice traveled 30,000 miles meeting with community and business groups, students, elected representatives, judges, and attorneys. The meetings resulted in the Open Courts Coalition, in which the judicial branch works with bar associations, consumer and defense attorneys, prosecutors, criminal defense attorneys, large and small law firms, and legal services organizations, to advocate on behalf of the public who rely on the courts. Within a few months of taking office, the Chief Justice surveyed all justices and judges within the judicial branch to ask how the Judicial Council staff agency could be more efficient. She then appointed judges and government experts--the Strategic Evaluation Committee--to thoroughly evaluate the Judicial Council staff agency. More than a year later, the committee reported to the Judicial Council, which accepted the recommendations and made them directives. In the meantime, the Judicial Council staff has been reduced by 30 percent. To oversee the vast court facilities program, the Chief Justice also appointed an oversight committee that includes a cost reduction subcommittee. In another push for efficiency, the Chief Justice supported, and the Judicial Council adopted, a plan by one of the council’s advisory committees to revamp the funding allocation methodology for trial courts. The move will result in more equitable funding for the trial courts. In 2013 Chief Justice introduced her Vision for Access 3D—calling for access to justice to be physical, remote, and equal. The Chief Justice then appointed a working group to develop a plan to provide a consistent statewide approach to ensure language access for all limited English proficient court users in California. The Judicial Council adopted the language access plan in January 2015. The Chief Justice appointed Supreme Court Associate Justice Mariano-Florentino Cuéllar to chair the Language Access Implementation Task Force. In 2014, the Chief Justice created the Futures Commission, chaired by Associate Supreme Court Associate Justice Carol A. Corrigan, to take a fresh look at the state’s legal infrastructure and to recommend ways to deliver justice and court services more efficiently without compromising fairness or due process. As chair of the Judicial Council, the Chief Justice has made the business of judicial administration more transparent. She opened to the public previously closed council meetings and invited public comment at the meetings. The council then adopted rules that opened up to the public its advisory committee meetings, making California one of the most transparent state judicial branches in the country. The council also initiated a liaison program, in which council members are assigned specific trial courts to visit and report back to the council. Those reports are posted online. As part of its oversight role, the council trimmed the number of its advisory committees and required the committees to submit annual agendas for approval to the council. The council also discontinued the development of a costly case management system that had been in development for almost 10 years. A task force authorized by the Chief Justice in 2013 helped the council's Technology Committee finalize a new technology strategic plan that included widespread participation by the trial courts, as well as input from the Legislature, executive branch, and the public. The council approved the plan in 2014. In another major initiative, the Chief Justice has taken a leadership role in promoting civic awareness and engagement in California. She launched the Power of Democracy initiative to promote civics literacy in California's schools. The committee overseeing the initiative includes representatives from all three levels of the California courts, the State Bar, and local bar associations, as well as local and state education organizations. The project included the California Task Force on K-12 Civic Learning, which was appointed by the Chief Justice and State Superintendent of Public Instruction Tom Torlakson. The task force’s final report is a blueprint to guide future policy discussions and possible legislation to improve K-12 civic learning in California. In addition, the Chief Justice, in collaboration with the State Superintendent of Public Instruction annually presents the Civic Learning Award to those schools that serve as models in promoting civics education. In April 2015, the Chief Justice was honored by the Pat Brown Institute of Public Affairs for bringing public attention to the crisis in civic education in the public schools.